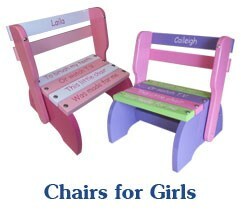 This sturdy timber chair is an ideal 1st birthday or Christening present, or just a special and useful little chair for a childs's room. It also doubles as a versatile step. 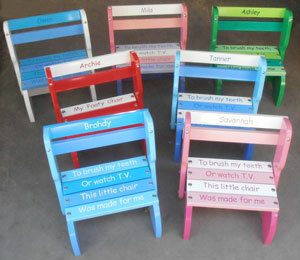 Each chair comes with a verse and childs name. 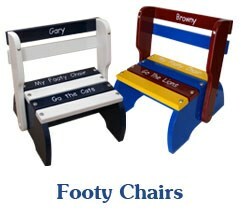 When an order for Kindy Chairs is placed, our website calculates the postage cost through Australia Post. As we also use a courier delivery service for most places along the Australian Eastern seaboard and Adelaide, we evaluate each order and determine the most economical method of delivery. In some cases credit card transations may be reduced before the payment is processed. Delivery cost for this item can be confirmed on ordering. Multiple chairs would be less per unit to send. If ordering more than 2 chairs they may need to be sent in multiple packages. 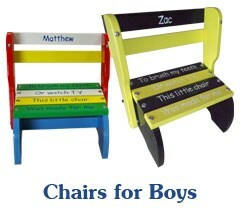 We will advise on delivery cost once order is received. POST 'S PERAMITERS. 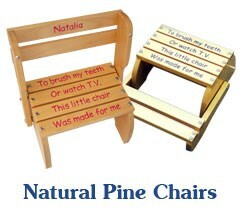 Please contact Wood puzzles for further information.